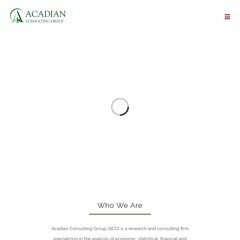 Topics: Acadian Consulting Group, Firm Overview, Staff, Capabilities, Issues Analyzed, and Companies Analyzed. There are 2 Nameservers, ns02.domaincontrol.com, and ns01.domaincontrol.com. Acadianconsulting.com's server IP number is 70.182.149.59. It is hosted by American Registry For Internet Numbers (Virginia, Chantilly,) using Apache/2 web server.